The prime rate is usually referred to be an index that is used to calculate the rate changes to adjustable rate mortgages (ARM) and other short term variable rate loans. 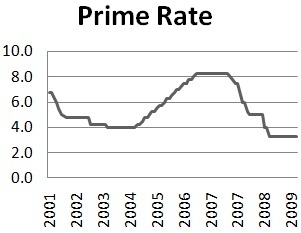 The most universally identified prime rate index is the Wall Street Journal prime rate (WSJ prime rate) that is published in Wall Street Journal. As WSJ defines it,” The prime rate is the base rate on corporate loans posted at least by 75% of the nation's 30 largest banks." Prime rate is a benchmark often used to set home equity lines of credit, some private student loans and many credit cards rates. Most of the credit cards and home line credits with up-and-down variable rates have a fixed specified prime rate index together with a margin value commonly called as “spread” or “margin”. As a convention, when 23 out of United States 30 largest banks change their prime rate, the Wall Street Journal publishes a composite prime rate change. In United States As published in WSJ the current prime rate is 3.25% and the Canadian prime rate is 2.50%..... read more. Federal funds can be defined as the unsecured loan transactions of reserved balances at Federal Reserve Banks that depository institutions make to one another. And the rate at which these transactions occur is called the federal funds rate or fed fund rate. The federal funds market committee (FOMC) has an important role in the execution of market policy as it sets the target level for the federal funds that influences the supply of reserves in the banking system. Federal fund open market actions or operations bring changes in the supply of reserve balances in the system thus creating a variable pressure on the federal funds rate. Federal fund interest rates are sensitive to the FOMC operations that have a direct impact on the reserve supplies in banks. The most common duration or term for fed funds transaction is overnight, though longer-term deals are arranged.